MEDINA, MN--(Marketwired - Jan 17, 2014) - Indian Motorcycle®, America's first motorcycle company, today released its plans for the International Motorcycle Show (IMS) this weekend at the Minneapolis Convention Center, which starts today at 3 p.m. and runs through 5 p.m. on Sunday. Throughout the weekend's events the company will showcase the all-new lineup of 2014 Indian Chief models, a first for Twin Cities motorcycle fans since their historic unveiling at the Sturgis Rally last August. In addition, Indian Motorcycle is proud to offer a number of exciting weekend events and programs to recognize and honor the Minneapolis/St. Paul area's military personnel. On Saturday only, Indian Motorcycle is proud to offer free admission to the IMS show as a part of the company's steadfast support of the U.S. military. All personnel with a valid military ID will be admitted to the day's events courtesy of Indian Motorcycle by presenting their credentials at the box office. Once admitted, military attendees are encouraged to stop by the Indian Motorcycle display to receive a limited-edition Indian Motorcycle pin or other special gift. In honor of those who protect our freedoms at home and aboard, Indian Motorcycle is proud to offer members of the U.S. Military a $1,000 incentive on the purchase of any of the three exciting new 2014 Indian Chief models. Stop by the Indian Motorcycle exhibit this weekend or visit www.indianmotorcycle.com to learn more about the "Honoring Heroes" incentive program and Indian Motorcycle's long and legendary history of supporting the military and our U.S. Armed Forces. 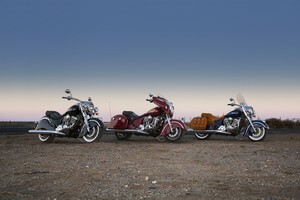 Stop by the all-new exhibit to check out the entire line of 2014 Indian Chief models including the Indian Chief Classic, the Indian Chief Vintage and the Indian Chieftain. Indian Motorcycle will feature a host of historically significant motorcycles including the 'Spirit of Munro' Streamliner, a one-of-a-kind custom vehicle built by Indian to pay homage to Burt Munro who famously rode into the history books on an Indian in 1962 at the Bonneville Salt Flats. Attendees will also want to check out a collection of fully restored pre-1953 era Indian bikes including a 1948 Vintage Indian Chief, a 1935 Indian Chief originally featured on HISTORY® Channel's 'American Pickers' series, and more. Throughout the weekend's festivities, Indian Motorcycle will highlight the inspiring design and power of the new Thunder Stroke 111 engine, the heartbeat of the 2014 Indian Chiefs. The exhibit will feature a cut-away version of the new engine to demonstrate the engineering prowess behind the massive new power plant that is standard on all 2014 Indian Chief models. Hometown Indian Motorcycle fans will be treated to a custom 2014 Chief Classic designed by the Indian Motorcycle Industrial Design team led by Greg Brew. Incorporating a number of accessories currently available for the Chiefs as well as a custom paint scheme and several unique features, this 'Big Chief Custom' is sure to inspire the customization possibilities for the new Indian Chiefs. Selections from the new 2014 Indian Motorcycle apparel line will be available for purchase, including casual wear, hats and holiday gifts. Fully accessorized bikes will also be on display highlighting the array of accessories for the 2014 Chiefs. The 2014 lineup of Indian Motorcycle models are on-display this weekend in Minneapolis at the International Motorcycle Show.